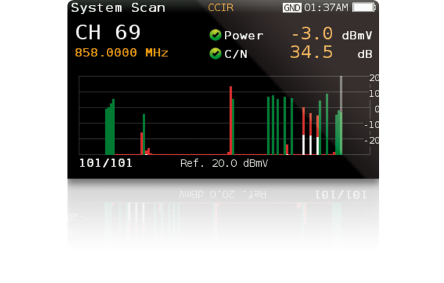 Comprehensive spectrum analysis, all your DVB and analogue measurements, scan & log, digital signal video, and much more. 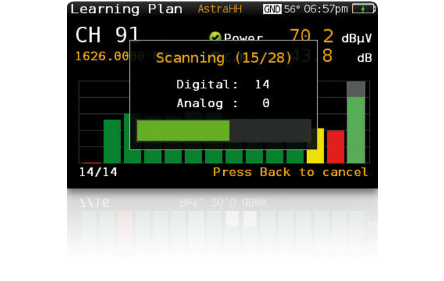 A complete set of easy-to-use functionalities for installing and monitoring TV analogue and digital signals. H30FLEX provides a full range of tools required to ensure the quality of television analogue and digital services. Combining our powerful and advanced real-time processing technology and an unprecedented ease of use, H30FLEX is the ideal tool for technicians working on the installation and maintenance of new-generation television networks. Easy decision-making Reduce installation mistakes with the on-screen Pass/Fail indicators, a graphical tool that helps and speeds up the interpretation of measurement results. 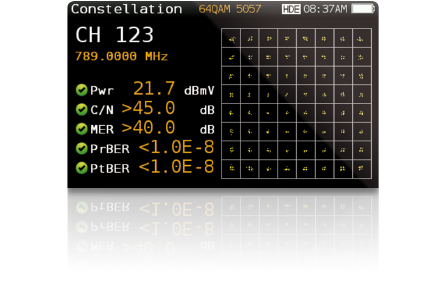 Different thresholds are available depending on the network area to be analysed: headend, multi-band amplifiers, bridging connection, connection records, user home, etc. Besides the pre-set values, you will be able to customize your own threshold values. The less the better Sometimes, taking a quick glance at one channel is all you need. 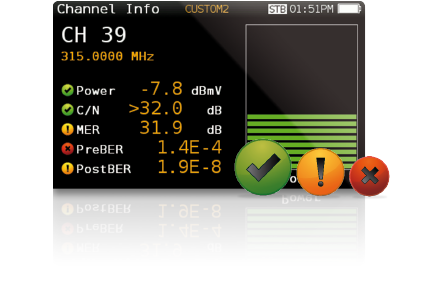 The advanced H30FLEX single-channel measurement option automatically detects the channel type, displaying the audio and video levels, A/V and C/N for analogue signals, and power, C/N, and appropriate quality measures for each type of digital signal. All these measures are taken by means of one single button; at that point, all indicators will be activated and display the “Pass/Fail” condition based on the thresholds specified by the user. Easy-to-interpret results, even for junior technicians. Monitored installationScan each existing analogue and digital channel in real time to determine the overall system frequency response. This function leverages the location-based thresholds to clearly show whether the signal levels meet the cable systems’ specifications with green, yellow and red bars. This feature provides an easy-to-understand, real-time view of the system, including the BER and MER values of the selected channel. 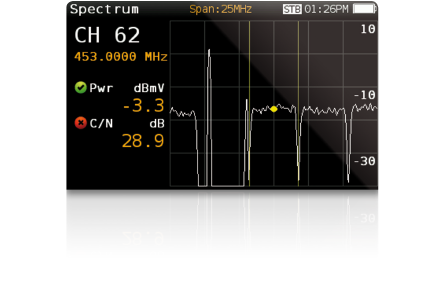 From 5MHz to full span “H30FLEX spectrum analyser provides a value range of 5, 10, 20, 50, 100, 200, 500 MHz and Full, as well as a reference level auto-adjust feature. 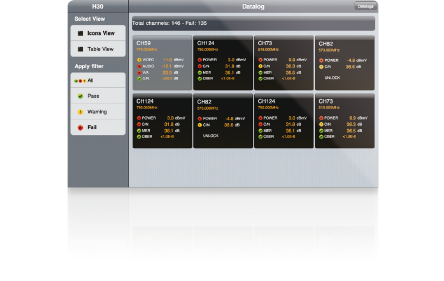 Real-time processing speeds ensure the capture of any signal incidents. You will be surprised by the accuracy and the level of detail provided by this ultra-portable pocket spectrum analyser. 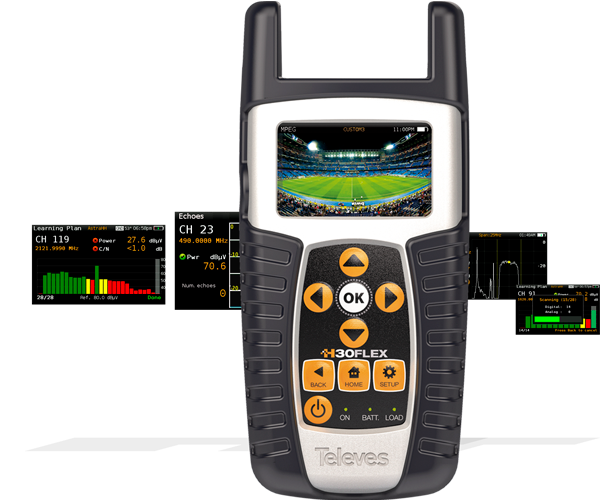 The ultimate tool for identifying and localising noise, interference, radiation, and any other signals that may be affecting the quality of the television signal distribution service. Custom channel plans Identify the channels in your distribution with the ultra-fast Capture Plan function, and from there build your own channel plan containing only the channels you are interested in. Furthermore, each channel will be displayed on a bar chart with the appropriate colour based on the selected quality threshold. MPEG video and detailed information Do you wish to know the contents offered on a DIGITAL channel? H30FLEX function MPEG will tell you. 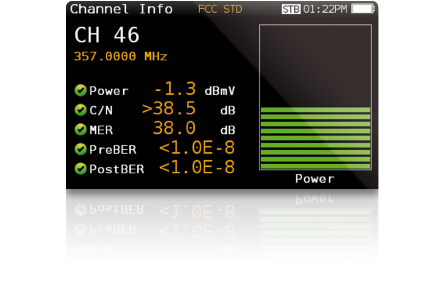 In addition to channel services display, you will get their key parameters: Service name, PID, resolution, audio types and figures, and NIT. A valuable help when troubleshooting your encoder configuration. Optimal signal reception In terms of DVB-T and DVB-T2 signal reception, controlling the absence of any echoes that could jeopardize reception is crucial. 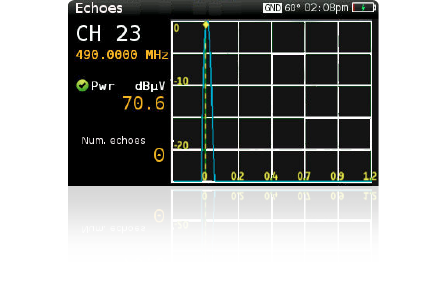 H30FLEX displays the echoes of the received signal, allowing the installer to minimize them for optimal signal reception. Save and download While you are taking measurements or looking for possible problems, you can save sample signal parameters for further in-depth analysis or just for record and use in your reports. It can also prove to be a useful tool for training purposes. 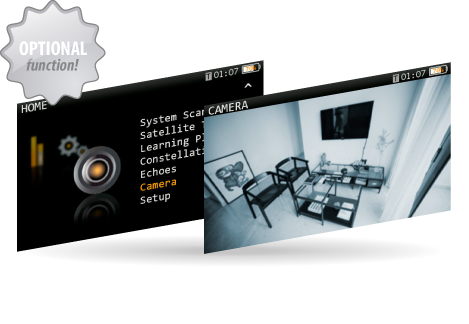 Camera display Installations of video surveillance systems are increasing. To display and monitor surveillance analog cameras, H30FLEX meters add a new software option and an USB video capture converter with Audio, Video and CVBS input connectors. H30FLEX displays NTSC and PAL video formats. The best option to verify the right functioning of the system.